But this experience had little to do with what was going on at the Suzuka race track. Instead, it came in a small cinema in a suberb of Nagoya which I had bust a gut to get to so I could see the new movie about Ayrton Senna. The feature film documentary 'Senna' has drawn a huge amount of interest from racing fans since the trailers for the Japanese and Brazilian versions appeared on the Internet in recent weeks. It was no wonder that, when myself and everyone else in the F1 paddock got a first chance to go see it, there was an eager rush to do so. Whether it was the F1 journalists and team members who wangled their way into the back of the sneak preview offered to Suzuka fans on the Thursday; or it was the numerous members of the paddock who purchased their cinema tickets and sat in various cinemas around Japan, nobody was left disappointed or unmoved by what they watched. Focusing on Senna's F1 career from the 1984 Monaco Grand Prix to the fateful weekend at Imola a decade later, the entire film was filled with magical moments: be it the music, the on-board footage or the behind-the-scenes moments that captured what this legendary Brazilian was like. I don't want to spoil what will be a great movie experience for any F1 fan when it finally gets it worldwide release in the middle of next year, but its success comes from the intimacy of the journey: and the fact that you feel a part of all he experienced during his life. You see the pleasure and pain of his world title success; you live there on-board with him during some of his famous racing laps; you share the embrace in the garage between father and son after that emotional victory at the 1991 Brazilian Grand Prix; and you cannot help but be overcome by the brutality of the Imola weekend as it plays out through both your eyes and his. Although lost in personal thoughts after the credits roll, the over-riding feeling from watching it was that it provided a stark reminder of just why each of us has an amazing passion and love for F1. We all accept that sometimes grand prix racing fails to deliver, and it can get boring at times when we're forced to keep defending the sport from the cynics who slam it for a lack of overtaking or a lack of interaction with the fans. But on the flipside it can produce real magic that stands up the hairs on your neck time and again. With the speed the sport moves at, it is hard sometimes to really appreciate all that we are getting blessed with. For those of us that travel to each race, time gets lost in an endless sequence of plane journeys and hotel rooms – and sometimes we forget what country we are in, let alone who won the last race. It is that rush of time that explains why one second we are looking forward to the season opener in Bahrain and the next, suddenly, we are just three races from the end of the campaign. Why one minute a promising talent like Senna emerges on the scene and the next he is taken away from us. So to kick back for two hours and be reminded of all that we love about F1 – even though it rammed home again just what a cruel sport it can also be – has lifted my spirits for the end of what may yet go down as the greatest F1 season. The title battle appears to be distilling into a three-way contest but, with the way the campaign has already delivered surprises and shocks, do not write off the McLaren boys just yet. For with things so tight at the top of the table – and car performance advantage not clear for the final events – there are untold possibilities for the rest of the year. Can Mark Webber lift himself up to get the win that would end Sebastian Vettel's title hopes? Will the Red Bull boys take points off each other and gift the crown to Fernando Alonso? Can Vettel keep away the mistakes that proved so costly for him earlier in the campaign? Can McLaren bounce back from its wobbles? There is everything to play for, and had Senna been here today he would have loved what he was seeing. This is a title fight not dominated by the politics and bitterness that left Senna so despondent at times, but full of all that he and us love. 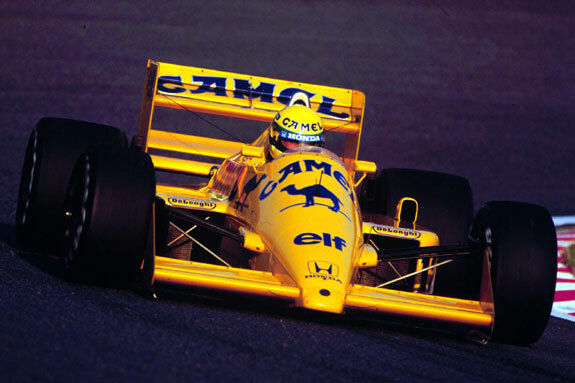 "When you are fitted in a racing car and you race to win, second or third place is not enough," Senna once said. There are five men now who know exactly what he means. And sat in that Nagoya cinema, I was reminded of it too.